Ever since they were revealed, the porgs have taken over Star Wars discourse like a Hutt at an all-you-can eat buffet. But none have been more beloved (or meme-ified) that the the little blighter that comes aboard the Millennium Falcon in the recent trailer. Turns out, this porg in particular was designed to emulate his more famous friend. Speaking to Empire about the new creatures to be found in the movie, Creature Workshop manager and effects guru Neal Scanlan dished about everything from those mysterious Ahch-To caretakers—described as some sort of evolutionary extrapolation of the porgs due to the planet’s isolated ecosystems—to BB-8's sinister sibling, BB-9E, who will apparently nearly come across a disguised BB-8 during the movie. But come on. Let’s be real: you’re here for those hot Porg details. 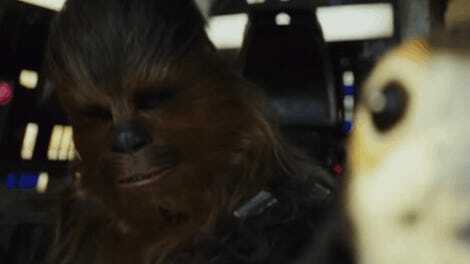 Specifically about that cute little Porg that seemingly becomes Chewbacca’s Han-replacement during this movie. 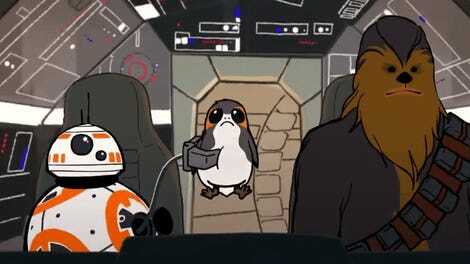 According to Scanlan, this porg in particular befriends Chewie during the Wookiee’s time on Ahch-To (I guess he needs something to do while Rey’s off learning the ways of the Jedi and all that), but in order to cement the bond between giant walking carpet and little walking carpet, the creature team altered this Porg to actually match some of the fur detailing and coloring found in Chewie’s luxurious coat. I mean, they’re already set to become the cutest addition to Star Wars since, well, BB-8's cutesy arrival back in The Force Awakens. If the porgs have to emulate something, they might as well emulate the original adorable fuzzball of the galaxy far, far away! It’s just the latest step in their heartwarmingly insidious plan to put us all in their porg thrall come December.